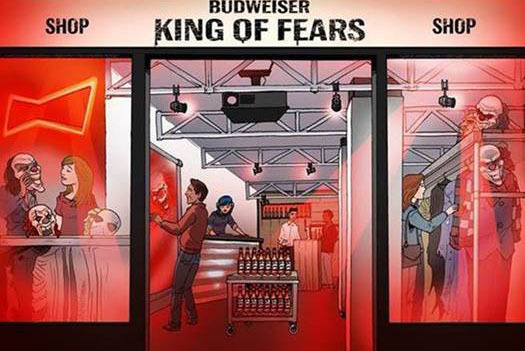 Budweiser is launching a haunted fancy dress shop in the run up to Halloween. The King of Fears shop is a mix between a haunted house and a fancy dress shop with mirror tricks and haunted clothes rails. There is also a DJ and a free Budweiser for everyone that makes a purchase. The pop-up on Old Street is part of the brand’s Halloween activity which culminates in a the Nightmare Circus Halloween Party with a DJ set from Foals. Sascha Cordes, senior brand manager at Budweiser UK, said: "Our King of Fears Halloween shop is a UK-first, so we’re extremely excited to be opening our doors to Londoners – who can pop in on their way to our epic Nightmare Circus Halloween Party. "The shop will feature an array of surprises, as well as items you can only normally find online – and all done in a way only Budweiser can."